We are pleased to provide metal forming and folding in Eastleigh, Southampton and throughout the UK. Firstly, this is the process of fashioning metal parts and objects through mechanical deformation. The workpiece is reshaped without adding or removing material, whilst its mass remains unaltered. If you are looking for panels, lids or items that need to be folded in various forms to meet your project specifications,our Press Brake can certainly be used to achieve these results. Various tooling allows the forms to be completed accurately and to the desired angles to create the finished product. Our team has a wealth of experience in metal folding and metal forming techniques. Consequently, we are able to advise and develop with the customer any bespoke items that maybe needed, which is even more important than anything else. Please visit our Projects page to discover some of the work that we have recently completed. In addition, we provide a full range of metal services from fabrication to shearing, sawing, prototyping and more. Finally, these can be viewed via our Capabilities page. Red Box Engineering offer metal forming and metal folding in Southampton, Eastleigh, Totton, Eastleigh and throughout the UK. What is Sheet Metal Folding? This is the process of fashioning a piece with out adding to it. The workpiece is re-shaped using folds etc. 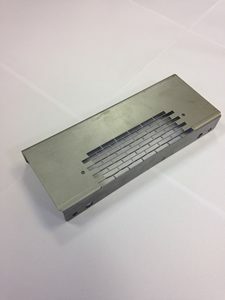 Our team has a wide range of experience in Sheet Metal Folding, therefore we are here to advise and develop with you any project you may have. Please contact us regarding all enquiries on 02380 254285 or by emailing sales@redboxengineering.com. Furthermore, users can contact us by filling in our online enquiry form.